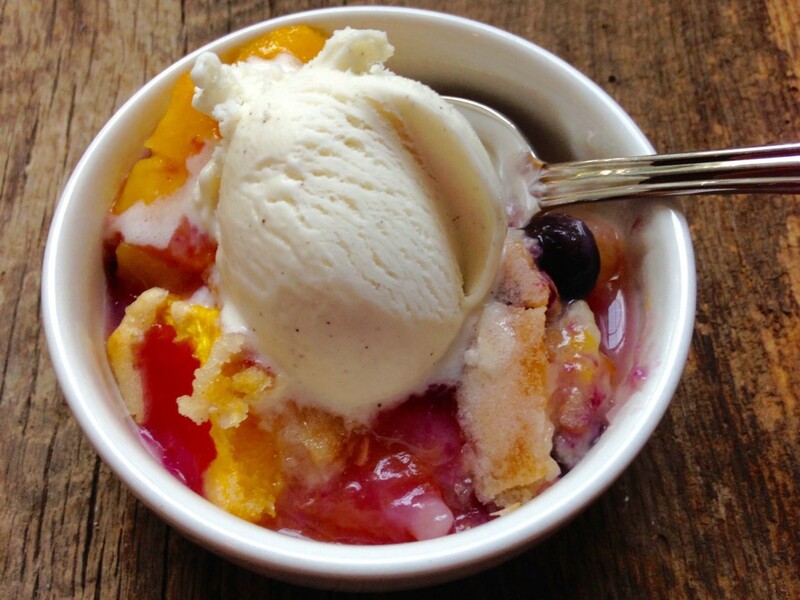 Nothing tastes better in the summer than a fresh fruit cobbler topped with vanilla ice cream. Peaches were on sale the other day so what better excuse to make this dessert! Summer is probably my favorite season. Juicy peaches, mangos, cantaloupe, and watermelon are just a few of the tasty fruits available this time of year. Plus it’s hot enough in Texas to go swimming and get a nice tan! I used to wish I lived up north where it was cooler, but after having a few icy winters here in Texas lately, I couldn’t be more happy to live here, and enjoy the 100 degree temps. 🙂 It takes some getting used to but I just love hot weather! Harper seems to love summer as well. She is a natural in the pool and hardly ever cries. 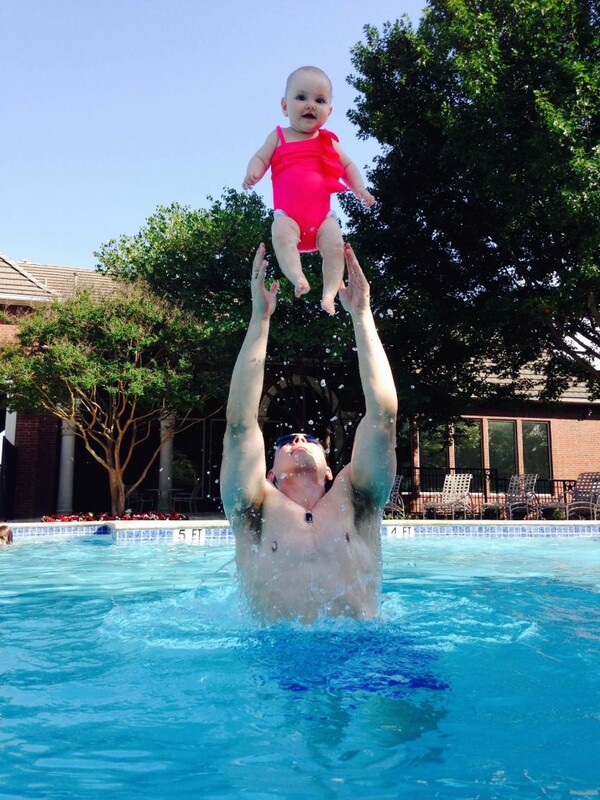 She loves being thrown up in the air like a little cheerleader. I seriously think she may be a flyer some day. Now onto the peach blueberry cobbler. 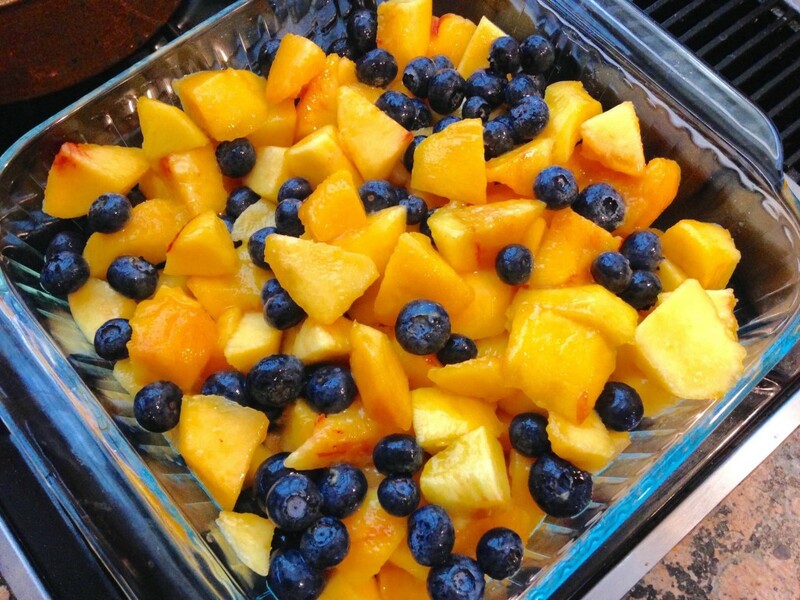 Two of my most favorite fruits, blueberries and peaches make for a great combination, but feel free to substitute 2 pounds of whatever fruit you want. I actually halved this recipe, adapted from Leite’s Culinaria. It called for over 4 pounds of peaches, but I was only able to get 2 pounds worth, thus I halved it. The size of this cobbler is perfect and easily serves 4-6 people, perhaps even 8 if you eat smaller portions. 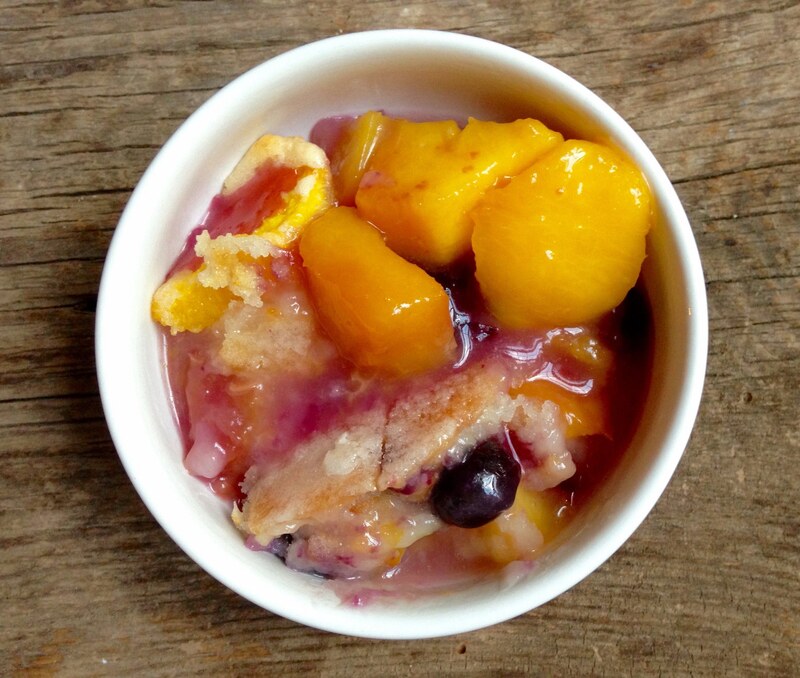 The fruit part of the cobbler is super easy…just peel the peaches and throw them in the baking dish. The topping is extremely simple too. You need an electric mixer to beat the butter and flour mixture, but it comes together in just minutes. 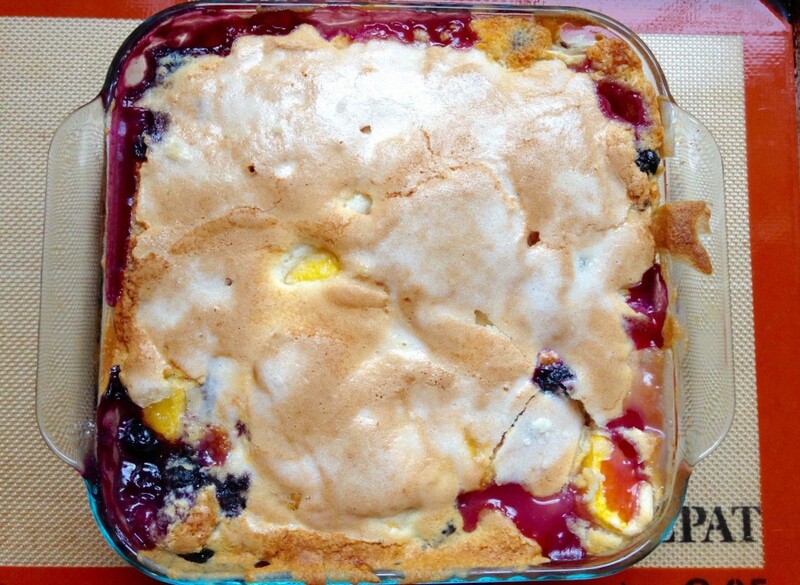 The hardest part about this cobbler is waiting an hour for it to cook. Any sooner than 60 minutes, and your crust will be too doughy. Matt hates waiting for dessert to cool when it comes out of the oven, so we dug right in after 5 minutes, but I don’t recommend that. It was too runny and too hot, so I definitely recommend waiting at least 30 minutes to allow the fruit to cool, the juices from the peaches and blueberries to set up, and the crust to get good and crisp. Trust me, this cobbler will still be warm 30 minutes later, and the perfect temperature to allow your vanilla ice cream to start melting. Appreciate the the rest of your summer, feel free to use all peaches, or substitute blackberries for blueberries, and enjoy! 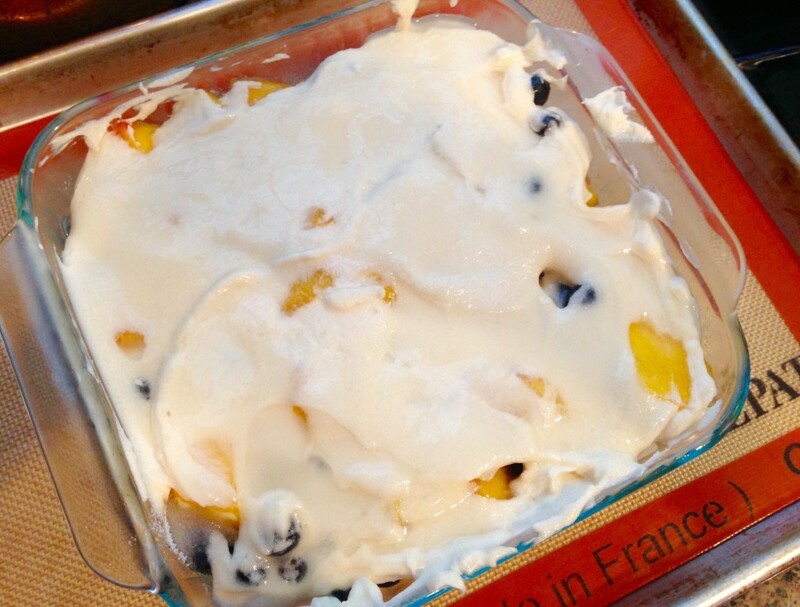 Preheat oven to 350 degrees F. Place blueberries and peaches in a 8x8-inch baking pan and pat them in a roughly even layer. Using a zester, finely zest the lemon evenly over the peaches and then squeeze the lemon juice evenly over the peaches. Make sure to catch any seeds before they plummet into the baking dish and get lost among the peaches. In the work bowl of a stand mixer fitted with paddle attachment, beat the butter and ¾ cup sugar on medium speed until sandy, about 1 minute. Add the flour, baking powder, and salt and beat again for another 30 seconds, until all the flour is incorporated and the mixture is evenly crumbly. Reduce the speed to low and slowly add the milk. Increase the speed to medium and beat until lightly fluffy, about 2 minutes more. Plop the batter in large blobs over the peaches. With an offset spatula or small knife, carefully spread the batter evenly over the fruit so it's no more than about ½-inch thick in any place. Sprinkle the remaining ¼ cup sugar over the batter. Then drizzle the hot water evenly over the sugar to melt the sugar into the topping. Place the baking dish on a foil-lined baking sheet and bake for 60 to 70 minutes, until the top is cracked and golden brown. You'll want to start checking it at 60 minutes. A toothpick inserted in the topping should come out dry - just be sure to check it in a few places. Let the cobbler sit in the baking dish on a wire rack for at least a half hour. Scoop the warm peach cobbler into big bowls and top with vanilla ice cream.